This classic piece of noir does what some might consider impossible: making an insurance salesman interesting. Of course, planning to commit insurance fraud makes the scenario much more interesting, even if it follows some of the basic tropes of the genre. Because the story is so short, only lasting just over three hours of audiobook reading, I feel the movie adaptation was able to include everything that made this story so engaging. I do think the ending was improved in the film, though, as the story’s ending felt a little disjointed from the narrative. What made Double Indemnity so enjoyable was how the main characters were so sure they’d get away with the crime they were about to commit. The details of the fraud were so thorough that the reader is almost convinced that nothing could go wrong. When the aftermath starts to unravel, that’s when the story began to get interesting. Suddenly, all the little things you’d never think of started to rear their ugly heads and tear the crime apart. 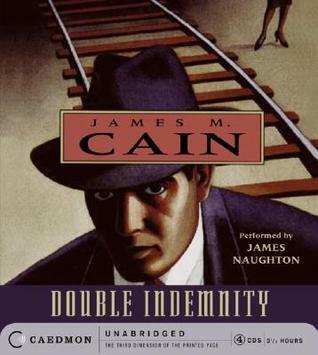 If anything, Double Indemnity proves that, no matter how well you plan a crime, there is always something that is bound to go wrong. There are no perfect crimes. While I enjoyed the revelation of the family’s backstory after the crime was committed, the one element that was a little uncomfortable was how the main character altered his amorous intentions from the mother to the daughter. It felt kind of creepy how he was justifying a 15-year age difference, even if she was a year past the age of consent. Maybe that was part of the point, though: prove that none of the characters were above reproach. They each had flaws that made them unlikeable in some fashion. A short and tightly-written noir classic, I give Double Indemnity 4.0 stars out of 5.